Jordan Lyles didn’t have the same kind of electric stuff or control that he has shown in his previous outings. 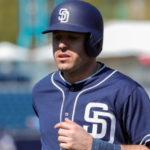 Good thing for him, the San Diego Padres brought the bats out today, scoring seven runs on ten hits, including six runs four home runs, while making clutch hits in key moments in a back-and-forth game that saw three lead changes. Similar to last night, the Dodgers would score the first run of the game before an out was registered, as Chris Taylor slugged the second pitch he saw over the left field fence to give Los Angeles the early lead. The rest of the Dodgers would go down quietly, including the clean up hitter Matt Kemp who has already collected 12 RBI against his former team. 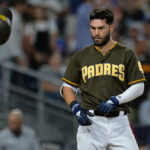 The Padres would bounce back the very next inning after Los Angeles starter Alex Wood walked Franmil Reyes on a full count to bring up the Padres shortstop Freddy Galvis. Galvis would only have to see one pitch from Wood, a juicy two-seam fastball on the outside corner of the plate that Galvis ripped for a two-run home run. A.J. Ellis would get stranded on first base after a single as Wood struck Manny Margot out and got Lyles to bounce into a ground out. Lyles would start his second inning of work with a walk of Yasmani Grandal, but a well located curveball to Cody Bellinger induced a double-play while Logan Forsythe would hit a weak fly ball to right field to end the inning. The third inning would quietly come and go for both teams with the Dodgers unable to bring Taylor home after his two-out double. However, the fourth inning would see Justin Turner take a hanging change up from Lyles deep for his first home run of the season. 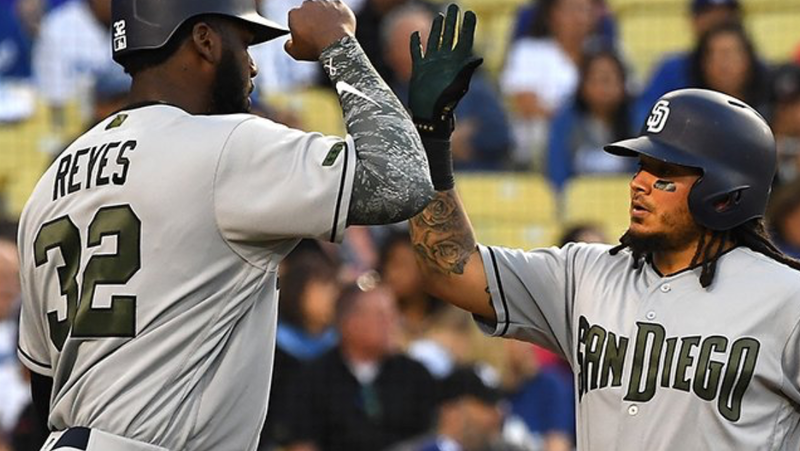 The hits kept coming for Los Angeles as Kemp and Grandal hit back-to-back singles. After a Bellinger ground out, Forsythe (boy howdy are there a lot of ex-Padres on the Dodgers) would snap a single to right field for an RBI while Joc Pederson would get on RBI of his own on a ground ball out. Lyles would strike out Wood to bandage the bleeding and end the inning. Wood made the mistake of relaxing to start the fifth inning as he set a change up on a tee for the lead off hitter Ellis. Said change up would get walloped into left field for a lead off home run and the Ellis’ first home run in a Padres uniform. Margot would slap a double to left field, but after a Lyles bunt moved him to third, he would get erased after trying to score on a shallow fly ball to Pederson in left field. Pederson would throw a strike home and Margot was wiped out at the plate. 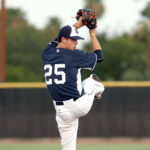 The bottom of the fifth inning was would be the last for Lyles, as his command would finally fail him at the worst time. After getting a quick out, a single by Max Muncy and a Turner walk would put runners on. A Kemp fly out got Lyles closer to the end, but some questionable calls from the home plate umpire helped Grandal to get a walk. A tense battle with Bellinger at the plate ended with Lyles walking the Dodgers center fielder and to the decision for Andy Green to make a pitching change. Tyler Webb, fresh up from Triple-A El Paso, would get Forsythe to strikeout to end the inning and prevent the Dodgers from scoring any more runs. 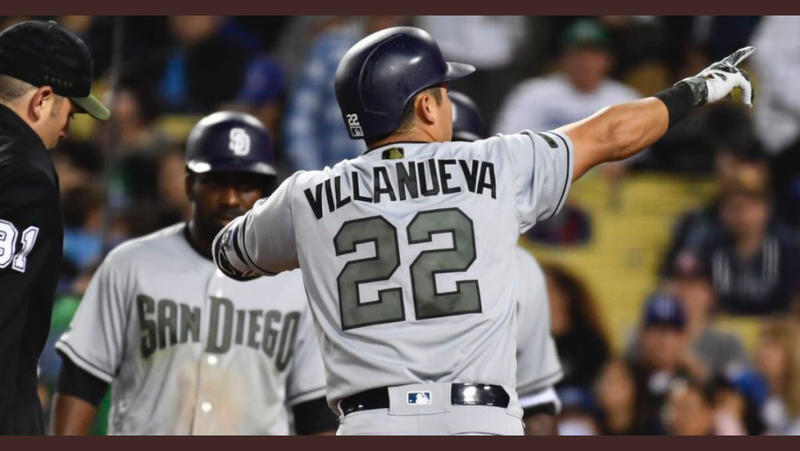 However, the Dodgers lead didn’t last long as Christain Villanueva, shortly after a lead off single by Jose Pirela, put a charge into an outside offering from Wood and hit a long shot to center field, tying the ball game for San Diego and ending the outing for Wood. The new reliever, Pedro Baez, would get quick outs from Reyes and Galvis to end the inning. Los Angeles would go down quietly in the bottom half of the inning, as Webb and Craig Stammen would get three fly ball outs to end the inning. It was looking like a quick inning for San Diego as the top of the seventh inning saw Ellis and Margot hit a fly ball out and pop out respectively. 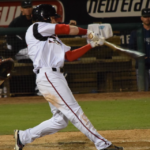 Matt Szczur, who came in as a defensive replacement in the previous inning, would leg out an infield single to begin the two-out thunder. Travis Jankowski would take a baseball to the elbow, leading to Pirela hitting a bouncing ball through the infield and allowed Szczur to scurry home from second base and just like that, the visiting Friars had a lead. Stammen would be forced to navigate through some rough waters after Villanueva committed two errors on one play, with an errant throw sailing into the Padres dugout allowing Turner to advance to second. A Kemp strikeout and a lazy fly ball to Margot in center would get the final two outs of the inning to end the inning for the home team. The Dodgers weren’t done being victimized by Villanueva, as Josh Fields‘ first offering to the Padres third baseman was a 79 MPH hanging knuckle curve ball. Villanueva would thank Fields for the early Christmas gift by hitting the ball 101.1 MPH to left field for a home run. The insurance run would be the only run San Diego would get with Fields striking out Franchy Cordero and fetching a double play from Ellis for the final three outs of the inning. The ever reliable set up man Kirby Yates would pitch in the eighth inning, inducing a ground out from Bellinger and a fly ball from Forsythe. Pederson would beat the Padres shift by hitting a 2-2 splitter through the open hole at third base for a single. Yasiel Puig would come up to pinch-hit for Dave Roberts, but a 3-2 splitter from Yates would send Puig to Dreamland and end the inning. 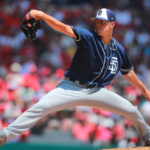 The Padres were unable to come through in the ninth inning despite loading up the bases, and the ever reliable Brad Hand would come in to work the ninth inning. 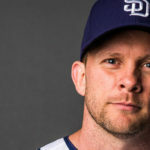 Taylor would be retired on a fly ball to Jankowski, pinch-hitter Austin Barnes hit a sharp ground ball that was gobbled up by Pirela, and an excellent frame job by Ellis on an outside slider caught Kemp off guard, and his strikeout would end the inning and the game for a San Diego win. San Diego will be using their bullpen staff to pitch tomorrow’s game, while the Dodgers will be using Walker Buehler. With his 13th and 14th home runs on the season, Christina Villanueva now holds the all time record for home runs by a Mexican rookie in a single season. The previous record was 12, set by Geronimo Gil in 2002 with the Baltimore Orioles. But wait, there’s more. With 14 home runs, he trails Bryce Harper of the Washington Nationals by just a single home run. 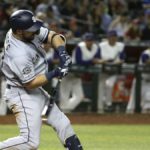 Villanueva could be on pace to break the Padres single-season record for home runs by a rookie, set by Hunter Renfroe in 2017 with 25. I love CV, but he is on pace for 40 errors! Who does that? He is also on pace for well over 50 home runs! Will he end up with more errors or HR’s?